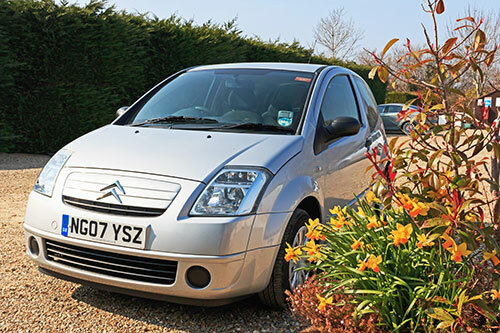 The car is a Citroen C2, a compact, three-door town car with air-conditioning & central locking, ideal for navigating to local villages, cities & attractions. Who can hire the car? You can reserve the car at Reception. If you want to be sure that it is available for a particular day you can do this when you book your pitch, there is no need to wait until you are on site. Just phone Reception on 01275 332 127. You need to bring your plastic photocard (or the full licence if it is an older, paper only licence) to Reception so that we can take a copy for our insurance records. You can also bring a printout from the new DVLA website or the sharing code (which must be less than 72 hours old), click here for details, or we can use the premium rate DVLA licence check phone line (which operates at restricted times). The rest of the paperwork is provided at Reception & consists of less an a dozen questions & a few signatures. Prices start from just £4 per hour with discounts for half & full day bookings, along with 3 & 7 day rates, it will be provided with half a tank of petrol & should be returned in the same condition. For full details visit the Bishop Sutton Car Club website.